Jeanne Larsen is the author of two books of poetry: Why We Make Gardens (& other Poems) (Mayapple Press, 2010), and James Cook in Search of Terra Incognita: A Book of Poems (University Press of Virginia, 1979), which won the AWP Award Series in Poetry. She is the author of two of literary translations: Willow, Wine, Mirror, Moon: Women’s Poems from Tang China (BOA Editions Ltd., 2005), and Brocade River Poems: Selected Works of the Tang Dynasty Courtesan Xue Tao (Princeton University Press, 1987). She has published an e-novel, Sally Paradiso (Brown Fedora Books, 2009), and three print novels, all from Henry Holt & Co.: Manchu Palaces (1996), Bronze Mirror (1991), and Silk Road (1989). 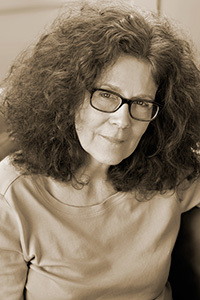 Larsen teaches in the Jackson Center for Creative Writing at Hollins University.